"The primary fund raiser for the Snohomish County Master Gardener Foundation is our annual plant sale. This year, the sale will be held on Saturday, May 5, 2018 from 9am - 2pm at McCollum Park. Each year, our plant sale features an extensive selection of perennials, shrubs, trees, berries, and grasses. In addition, our sale is famous for an amazing selection of tomato varieties - old favorites, new varieties, heritage plants and more. This year, we will have 8000 tomato, herb and vegetable starts to help you get a jump on your kitchen garden, including basil, cucumbers, squash, peppers and lettuce." Featuring an excellent selection of plants from our region’s finest nurseries. In addition to the vendor plant market, you can tour the garden and experience its springtime beauty. 11am “Jewels of Spring; Ephemerals in the Pacific Northwest,” by Dan Hinkley, Heronswood founder and director. 1pm “Dining with Deer: Designing a Garden that’s Not a Salad Bar,” by Dr. Ross Bayton, Heronswood taxonomist. GARDEN ENTRY FEES directly support garden restoration, maintenance and enhancement work: $10/adults, $5/ages 7-17, FREE for Heronswood Garden and Port Gamble S’Klallam Community members. Gear up for the spring with wildlife-friendly native plants from a variety of local nurseries! We will be at Heronswood Nursery in Kingston on Saturday, September 15, 2018 from 10 am - 3 pm for yet another of their wonderful open garden and plant sale events. Come tour the gardens and peruse plants from some of the best specialty nurseries in the NW! We will be at Heronswood Nursery in Kingston on Saturday, July 21st 2018 from 10 am - 3 pm for yet another of their wonderful open garden and plant sale events. 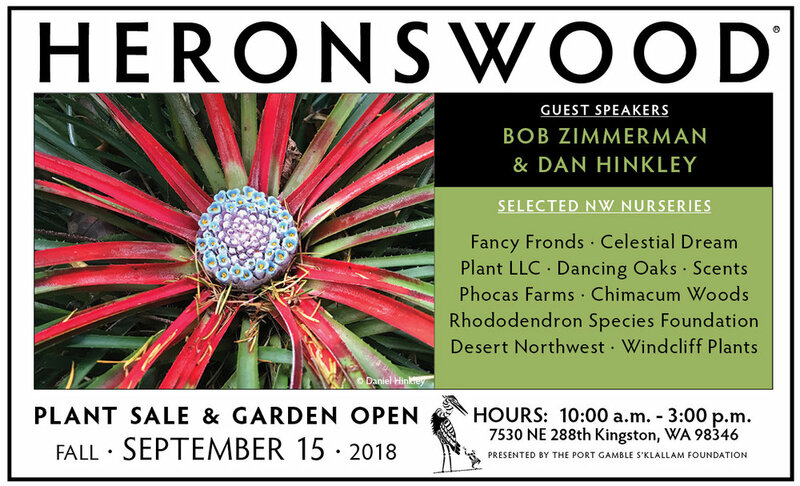 Come tour the gardens and peruse plants from some of the best specialty nurseries in the NW! The second plant sale and open garden of the spring season at Heronswood on Mother's Day weekend. The first of four spring plant sales and open garden days at Heronswood. 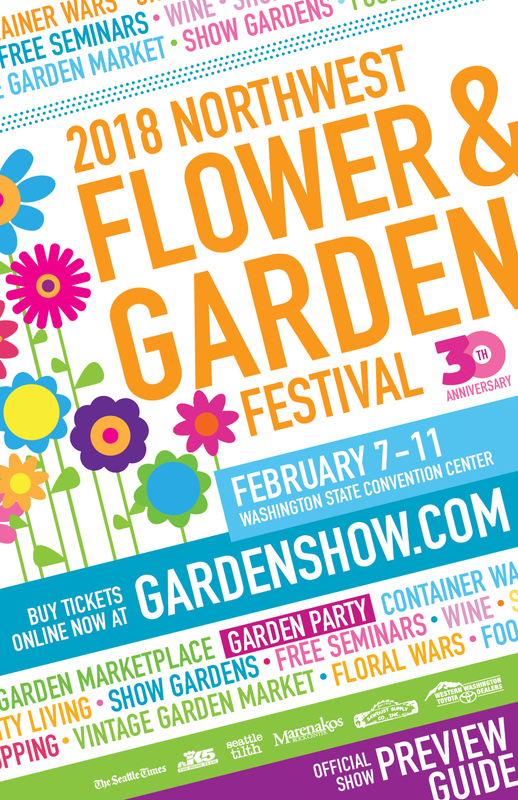 Come join us once again at the Northwest Flower & Garden Show in the Seattle Convention Center February 7th - 11th. Our exhibit this year will focus on harmony between botanical geometry and man-made imitations of natural plant forms. Expect lots of triangles and circles! Our annual Fall Plant Sale features wildlife-friendly outdoor plants from a variety of local vendors, including: Tadpole Haven Nursery, Madrona Nursery, Fancy Fronds Nursery, MSK Rare Plants Nursery, and Botanica. Contact info@seattleaudubon.org or call 206-523-4483 for more information. Our biggest sale of the year features thousands of plants from specialty nurseries, our famous NPA Border and members’ gardens. Shop in comfort indoors. Discover new plant introductions, the rare and unusual, as well as established favorites. Perennials, natives, woodland plants, grasses, shrubs, small trees and much, much more. Shop tax-free while you help support the educational programs of NPA. Plenty of free parking. For quick plant sale access, park in the lots on the west side of campus, off College Way North, between 95th & 97th. Parking is free in these lots on Sunday. Get driving directions. Please donate plants from your garden! Are there plants in your garden that you would like to donate? We welcome all kinds of plants: divisions, seedlings, treasures, favorites and everyday plants. Please include the plant name (Latin and/or common) on a white plant label. For questions, or to find out where to drop off your plants, email us. Unload plants, set up tables, price plants, set up displays, cashier—there are dozens of volunteer jobs to do at the Spring Plant Sale. Many NPA members volunteer so that they can get into the sale early and scope out the choice plants before the hordes of shoppers hit. Everyone has fun and it’s a great way to meet other NPA members. March Mania is one of the first big plant sales of the year in the Seattle area. It features spring ephemerals and choice garden plants not readily available at other times of the year. The sale brings together a fabulous group of specialty nurseries and growers who are not generally open to the public. Learn from these experts and let them help you choose some of the earliest bloomers of the season to brighten up a drab space in your garden. Most of the sale is held indoors, where the kids can enjoy fun activities just for them while you shop. Shop great vendors like Windcliff, Bouquet Banque, Growing Girls, Lee Farm and more. Proceeds from this fundraiser benefit the educational programs of NPA and the NPA Border. What a great opportunity to help support your favorite gardening organization and reward yourself at the same time by shopping for new plants to wake up your garden. When you see the exciting display of spring plants, it is always hard to choose, but you can get help with your choices by joining Richie Steffen and Holly Zipp at 10:00 a.m. in the library meeting room. They will be sharing their tips about which plants to choose to give your garden more late winter and early spring interest. Their discussion will be illustrated with a selection of plant cuttings from the Miller Botanical Garden. Botanica: Uncommon and underused perennials. Bouquet Banque Nursery: Specialty woodland perennials, with an emphasis on unusual kinds of cyclamen and epimedium. Fancy Fronds: Temperate ferns, Victorian cultivars, desert ferns, alpine ferns and spike-moss. Keeping It Green Nursery: Hardy orchids, unusual woodlanders, hard-to-find natives. Lee Farm & Nursery: Trees, shrubs, perennials, grasses, hardy fuschias. Madrona Nursery: Special perennials and some native plants. MSK Rare Plant Nursery: Native and rare plants adaptable to the Pacific Northwest. Old Goat Farm: Perennials for sun or shade. Rhododendron Species Foundation: Species Rhododendrons. Taking Root Nursery: Hostas. (425) 488-9796. Don't miss our exhibit at the Northwest Flower & Garden Show at the Seattle Convention Center February 22nd-26th. This year our display garden will showcase bug's eye view of the garden, with a focus on beneficial garden insects! You won’t want to miss two great lectures being presented free of charge at the September 17th Heronswood Plant Sale & Garden Open. Lectures are held in the Garden Shed. Tickets are available 30 minutes prior to each lecture at the Information Table. Seating starts 15 minutes before the talk begins. Limit 2 tickets/person per lecture. General seating applies. Friday September 16 from 9:00am to 3:00pm,. Stock up for fall planting at the Northwest Horticultural Society’s Fall Plant Sale, at the Center for Urban Horticulture. Blue Frog Nursery:Perennials, groundcovers and shrubs. Fancy Fronds: Temperate ferns, Victorian cultivars, desert ferns, and some other choice plant selections. Far Reaches Farm: Unusual perennials and bulbs, drifting into a few woodies and alpines. Foliage Gardens: Ferns, both hardy natives and related plants. Lael’s Moon Garden Nursery: Ornamental trees, shrubs and selected perennials. Lee Farm & Nursery: Trees, shrubs, perennials, grasses, hardy fuchsias. Madrona Nursery: Special perennials and some native plants. (206) 323-8325. Queen’s Cup Nursery: Puget Sound natives, including rare and hard-to-find plants. (206) 567-4150. Rhododendron Species Foundation: Species rhododendrons and companions. Robinwood Nursery: Eclectic selection of perennials, grasses, fuchsias, shrubs. Scents Nursery: Scented trees, shrubs and perennials. Taking Root Nursery: Unusual perennials, hostas, ornamental grasses, and ferns.